I figured I'll post up a write up for something that I spent days gathering bits and pieces of info on. When searching various forums, it seems there are a lot of questions on this topic, but info is scattered in several places. There are enough people here running Holley systems that maybe someone else will benefit from it (or who knows, maybe it will draw a few visitors to the site). This should also work with other standalone systems that have PWM output capability. After melting a 10 gauge wire from my 4 cylinder single Contour fan that was cycling on and off at high speed only, I starting doing some research on variable fan speed controllers. I wanted the ability to have a "soft start", or slowly ramp up fan speed to avoid a sudden load onto the electrical system. 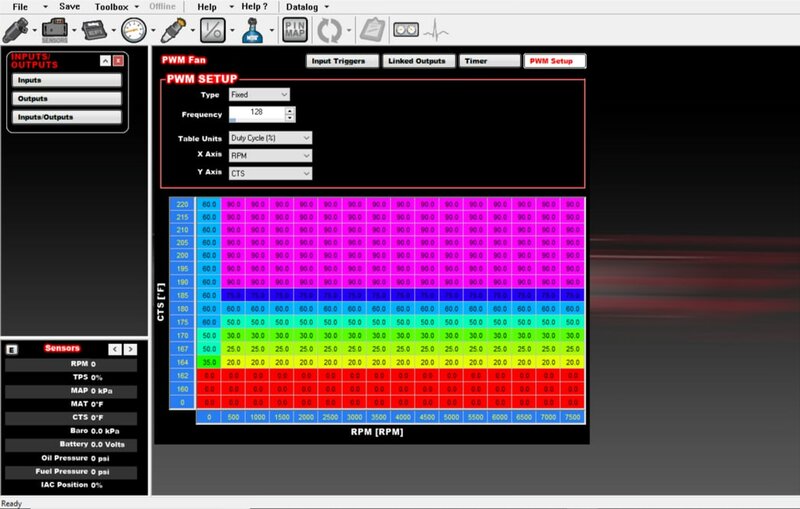 Knowing that my Holley HP EFI system has PWM output capability, I started looking for information on how to use the ECU to vary fan speed based on coolant temp. I found that some sort of control module is needed to convert PWM signal into variable voltage. 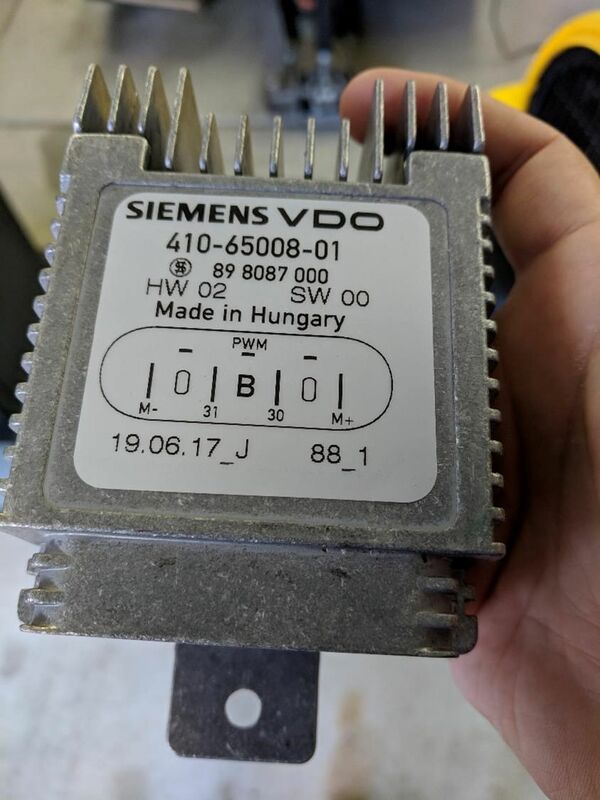 There are a few options, but the Siemens fan controller that is used by a C6 Corvette is a common one that has been proven to work with this setup. Later on, I found that the 06-09 Ford Fusion (4cyl or V6, doesn't matter) uses the same type of fan controller. If I were to do it again, I would have bought the Fusion fan controller, because it can be purchased with the wiring pigtail included. 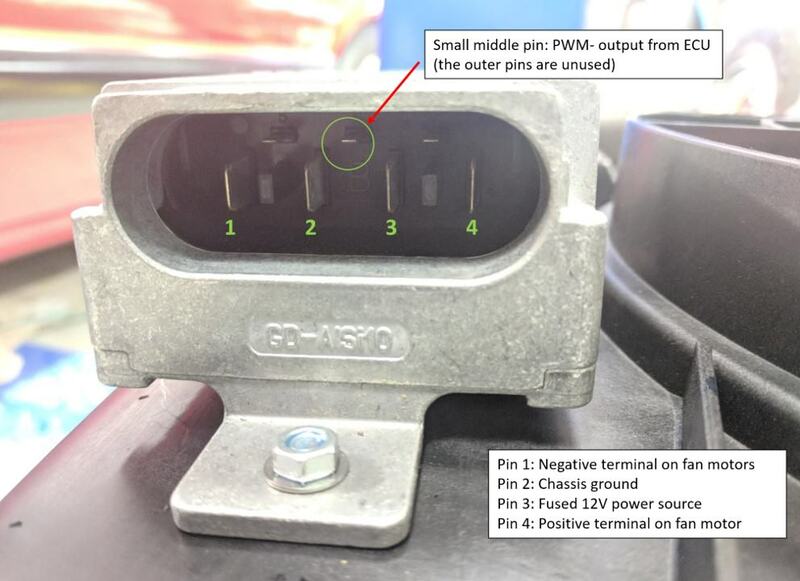 Anyhow, I bought the C6 Corvette fan control module and now had to source a wiring pigtail, or the correct connector. After hours of searching for the connector body, pins, and seals, the only connector body part number I could find was listed as discontinued or unavailable wherever I looked. I ended up having to source a used pigtail from someone on Facebook who had an extra from a junkyard. The only way I found to get the correct pigtail is to buy a Corvette fan assembly or go to a junkyard. Otherwise it's nearly impossible to find. 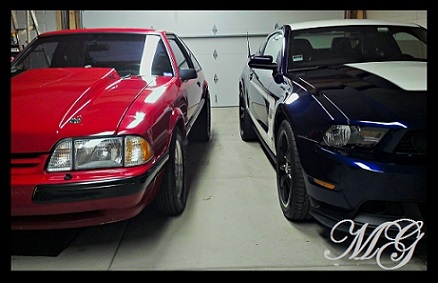 Choose either one of these. The Corvette fan control module is cheaper, but doesn't come with a pigtail. You can source a used one from a junkyard and save a few dollars, or you can buy the Fusion module that includes a new pigtail. Now that you have the fan control module, you will need to know the pinout to wire it up with your fan. In my case, I used a V6 Contour dual fan (purchased new from Amazon for ~$100). 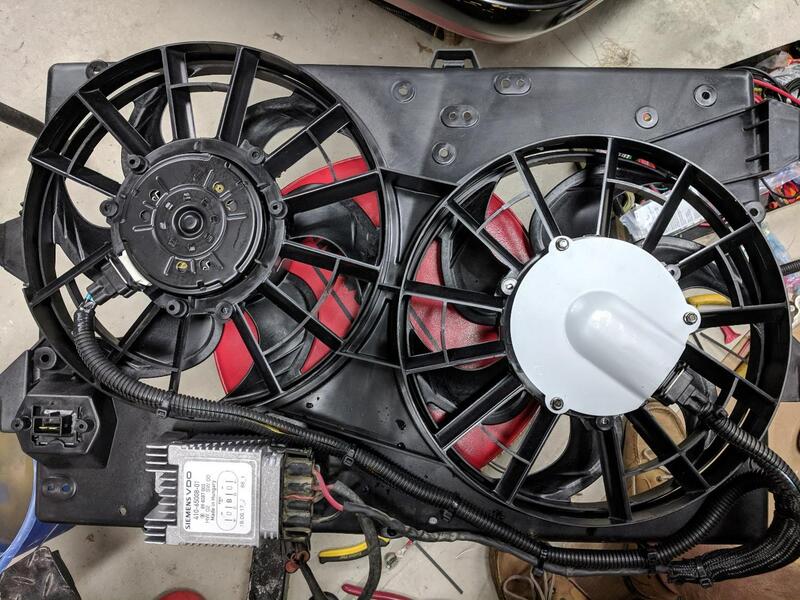 From there, I installed the fan assembly on the radiator and connected the wiring to the car (12V fused power, chassis ground, and PWM(-) output from the Holley ECU). The fan module needs a PWM- input, which can be either pin B3 or pin B10 on the Holley ECU. I used pin B3 since it was unused. 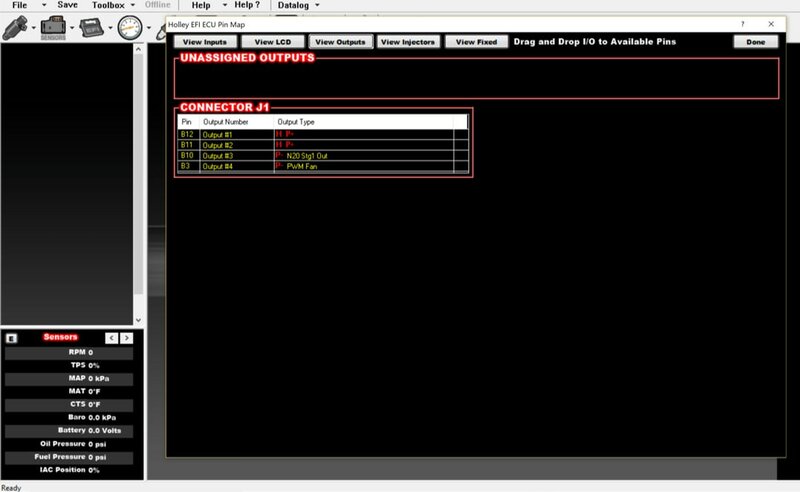 Now, go back to the I/0 menu where you named and assigned the output and click on configure. Leave switched input sensor set to 0 and click the drop down box in the middle of the screen to select "OR". Choose 1 as your number of input triggers. 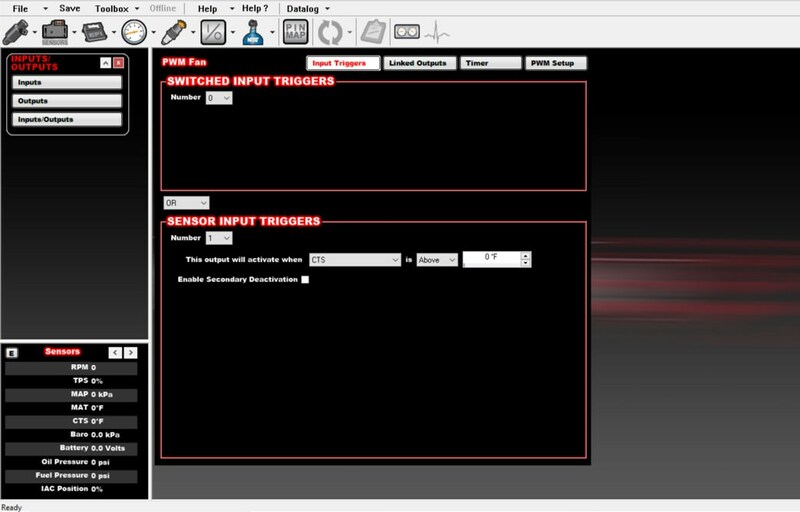 Select CTS as the input trigger and enter Above 0 degrees as the value. Next click on PWM Setup. Change Type to "Fixed" and Frequency to 128 Hz. For table units, choose Duty Cycle %, and for your axes, choose CTS as your Y and RPM (or vehicle speed if you have a vehicle speed sensor installed) as your X axis. 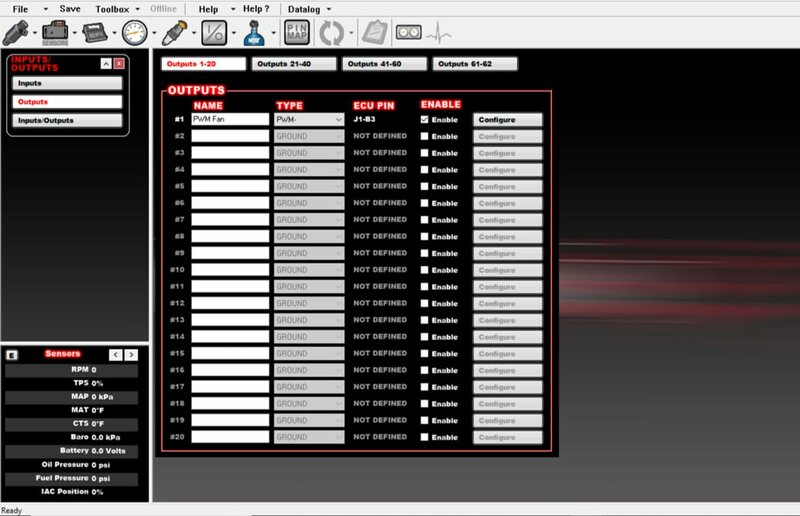 Fill in your table to run the fan at your desired speed based on temperature and RPM. Duty Cycle % must be between 10% and 90%. I've read that anything below 10% or above 90% is meant for diagnostic purposes, but I don't know about that. 90% sounds like it's running at full high speed, so I'm not going to question it. Here is my table that I quickly threw together. This will probably get some fine tuning after I drive the car a little. One thing I did, that a lot of people may not like, is set the fan to run at key on/engine off. 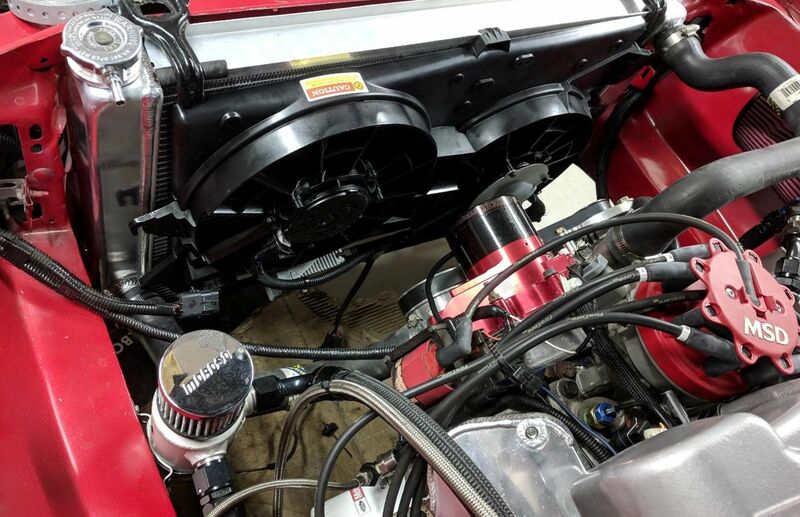 Since I have an electric water pump, I like being able to run the fan and water pump for a few seconds to cool the engine down a little after I shut it off. This is nice for the staging lanes at the drag strip. That's it. To test the fan to make sure it turns on and off, you can enter duty cycle values at 0 RPM at whatever your ambient coolant temp is. Be sure to use heavy gauge wiring on your 12V power supply and ground. Use a minimum of 10 gauge and be sure to use an appropriate fuse. I used a 30 amp Maxi fuse. Last edited by MGLT; 09-05-2018 at 12:19 AM. Here is a good video by andrewb from the Holley forums that demonstrates how it works. I've seen a lot of people use the Corvette fan, but nobody with the Contour dual fan. As far as I know, it's just a DC motor, so this should work with any fan. If I were to do this again, I'd be tempted to try the entire 06-09 Fusion fan assembly. You can buy the fan with module included for pretty cheap. The width and height dimensions should match closely to a Mustang radiator, but I couldn't find any thickness dimensions. I'm guessing it would be comparable to a Mark VIII fan. Last edited by MGLT; 09-05-2018 at 12:29 PM.